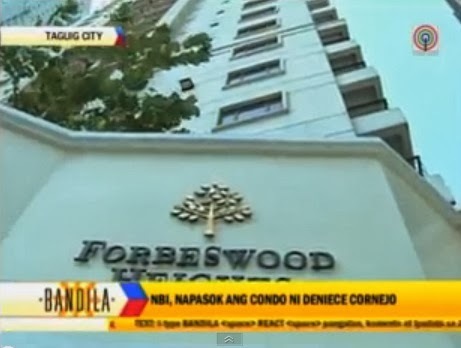 Manila, Philippines - The National Bureau of Investigation (NBI) on Monday inspected the Forbeswood condo unit used by Deniece Cornejo and found out no damage on furniture or appliance after the mauling incident to actor Vhong Navarro. The statement of NBI is contrary to the claims of Cedric Lee that some properties of Deniece were damaged as a result of their fight at evening on January 22. Lee also denied extortion to the It's Showtime host. "Ang issue sa pera ay di po extortion. Nag-come up kasi yan kasi nadamage yung properties ni Deniece sa condo dahil sa pagu-upakan namin... nabasag yung 40-inch TV," he said. It was the first time the NBI entered the unit. The group who checked the unit includes the building administrator, unit owner Soledad Ramos, and Greg Binunus, a Malaysian who was renting the unit. “Nakasabit pa rin ('yung TV). Sinabi naman ni Mrs. Ramos na so far wala naman siyang nakitang mga gamit na nadagdag o nabawas doon nung pinagamit niya 'yun(g unit) kay Mr. Greg Binunus,” Atty. Rommel Ramirez of the NBI said. According to reports, Deniece had been occupying the unit for only two days when she first brought Navarro there on January 17. Meanwhile, the blood stains caught the attention of NBI. Since there's no forensic expert accompanied on their inspection, NBI agents said they will re-schedule the sample examination. The NBI is now waiting for an affidavit of Binunus to explain his relationship with Cornejo. In a separate interview, Binunus said he only met Cornejo at a party last December 2013. Then began texting afterwards and allowed Cornejo to occupy the condominium unit for free. In addition, Binunus claimed he does not know Lee.